I joined the Grange out of curiosity. When I met Walt we could never have a date on the 2nd or 4th Thursday of the Month. He had a Grange Meeting. What is the Grange? What was he up too? Curiosity got the best of me. I joined. Hopefully all of you have your Bluebooks by now. Please check out the Lecturers section and get started on your projects. Don’t wait until the last minute. And, if you have any questions or suggestions regarding the Lecturers Department please get in touch with me. LECTURERS CONFERENCE 2009 which will be hosted by the Rhode Island State Grange will be held at Bridgewater State College, Bridgewater, Massachusetts. This should be good news for people from our State who want to attend on a part-time basis. And, more good news, the prices will be similar to last year – For the full conference the cost with a single room will be $195 and for a double room, $180. If you have any specific questions, please do not hesitate to call or write me. I have a meeting in New Hampshire the end of April and shortly after that I should have everything ready for mailing to our Lecturers and other regular attendees. If you do not receive yours by the middle of May, please contact me. The title of the Conference this year is “Let’s Celebrate”. (Sound Familiar?? – I wasn’t the one to suggest it.) Connecticut will be celebrating Halloween. If you have any program information on this subject I sure would appreciate receiving it. 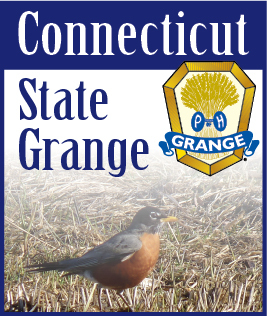 Smile, and tell your friends and neighbors about the Grange. It’s the best bargain around.